Problem: Soil erosion, gullies, nutrients loss, road-side & river bank erosion, river and lake pollution, groundwater depletion. Idea:Planting continuous hedges of Vetiver on the contour lines or along rivers and roads. the leaves of vetiver filter the runoff while the deep roots retain the soil and help water infiltration. Difficulty: Implementation is labour intensive. Geographic Area:Tropical to semi-arid areas, needs sun. How Long does it take? After 6 month, the hedge is usually already fully effective. Terraces usually form after 3 to 4 years. The Vetiver System (VS) is dependent on the use of a very unique tropical plant, Vetiver grass – Vetiveria zizanioiodes. The plant can be grown over a very wide range of climatic and soil conditions, and if planted correctly can be used virtually anywhere under tropical, semi-tropical, and Mediterranean climates. It has characteristics that in totality are unique to a single species. When vetiver grass is grown in the form of a narrow self-sustaining hedgerow it exhibits special characteristics that are essential to the many different applications that comprise the Vetiver System. The species of Vetiveria zizanioides, that is promoted in nearly 100 countries for VS applications originates in south India, is sterile, non invasive and has to be propagated by clump subdivision. Generally nursery multiplication of bare rooted plants is the preferred method. The average multiplication rate varies but is normally about 1:30. After about three months nursery clumps are divided into planting slips of about 3 tillers each. These are then planted 15 cm apart on the contour to create, when mature, a barrier of stiff grass that acts as a buffer and spreader of down slope water flow, and a filter to sediment. A good hedge will reduce rainfall run off by as much as 70% and sediment by as much as 90%. A hedgerow will stay where it is planted and the sediment that is spread out behind the hedgerow gradually accumulates to form a long lasting terrace with vetiver protection. It is a very low cost, labor intensive technology (linked to the cost of labor) with very high benefit: cost ratios. When used for civil works protection its cost is about 1/20 of traditional engineered systems and designs. 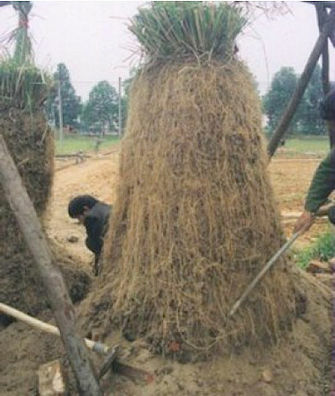 Vetiver grass can be used directly as a farm income product, or it can be used as an application that will protect river basins and watersheds against environmental damage particularly point source environmental problems relating to: (1) sediment flows (2) excess nutrients, heavy metals and pesticides in leachates from toxic sources. The two major uses are closely linked. Below are the main categories of application. You can find Power Point type presentations for each category at: http://picasaweb.google.com/VetiverClients. All these applications can directly or indirectly impact on the rural poor through either protection of farm land and, where necessary its rehabilitation, provision of direct farm income, or indirectly improving the quality of life and resources available to the poor. Is vetiver grass invasive? The seeds (if produced at all) of the south Indian cultivar of Vetiveria zizanioides are sterile and its roots are not stoloniferous. Thus vetiver hedgerows remain where planted and do not compete with native species in fact to the contrary vetiver hedgerows improve the microclimate and in consequence help native species to grow and thrive. Vetiver Systems can be used by most of the sectors involved in rural and community development. It should not just be left solely to the agricultural sector to promote, but should be incorporated, where appropriate, into the development plans for community, district or region. If all the sectors use it, there is then an opportunity for vetiver grass producers, both small and big to get involved with VS as an income generating enterprise, whether it be producing planting material, contracting as landscapers for slope stabilization and other needs, or selling vetiver byproducts such as handicrafts, mulch, thatch, forage and other material. Over and above this, of course is its use in on farm soil and water conservation, and the benefits that are derived from that application. It is a technology common to so many different applications that if widely applied might be the kick-start to a significant climb out of poverty for a large segment of the community. 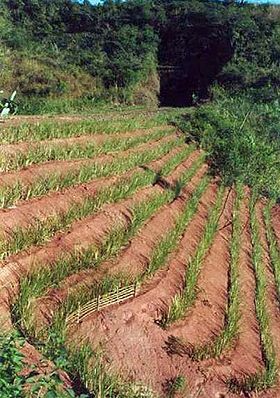 Vetiver was introduced successfully for erosion control in the Fiji Islands by John Greenfield. These contour hedges have proved efficient over the past 60 years. Natural terraces of up to 3 m formed along vetiver hedges within 25 years. The problem Fiji faces today is the destroying of thoses hedges by people ignorant of the specific role of vetiver. This page was last edited on 31 May 2017, at 10:33.